Local Immigration Partnership (LIPs) is the mechanism through which Immigration, Refugees and Citizenship Canada (IRCC) supports the development of local partnerships and community-based planning around the needs of newcomers. LIPS engage various stakeholders in the partnership development process including employers, school boards, boards of trade, and levels of government, professional associations, ethno-cultural organizations and the community social services sectors. "Oxford County is a great place to live because it's the perfect size community to raise a family, work and enjoy life. Not too big, not too small, central to so many things." The Oxford Local Immigration Partnership Council is committed to nurturing a welcoming, inclusive, safe community that embraces and truly values diversity. We recognize that by supporting and engaging newcomers, we will help ensure economic vitality and prosperity into the future. 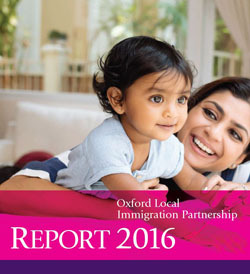 Click to read the Oxford Local Immigration Partnership 2016 Annual Report. Click to read the Oxford Local Immigration Partnership strategic Plan moving forward. 1.1 The Oxford Local immigration Partnership Council provides guidance and direction in the development of the Oxford Settlement Strategy. 1.2 The Council is a strategic planning body composed of representatives from our community that will participate in planning and coordination to enhance the delivery of integration services to all newcomers. 1.3 The Council will meet in order to develop a comprehensive and strategic approach to immigration, integration and retention for Oxford County. 1.4 The Council will work and consult with relevant networks and establish linkages with other community initiatives within Oxford to develop our strategy. 2.1 Acceptance, honesty, accountability and fairness within the group and within the larger community. 2.2 Respect confidentiality of LIP Council Business. 2.3 Inclusivity of all LIP Council members and within all areas associated with the LIP initiative in general. 3.1 To enhance local and regional service delivery to newcomers while identifying community driven social innovation and addressing gaps in service. 3.2 Encourage and engage the community and human service providers in the settlement process. 3.3 Improve economic, social, and civic opportunities and participation for all newcomers.